Out of all the X-Men titles on the stands, writer Rick Remender's Uncanny X-Force has consistently been one of the best. This is thanks to intricate story arcs, the morally muddled politics of Wolverine running an assassination squad, and the comic's willingness to delve into byzantine corners of X-Men lore. And this May, Remender's launching Final Execution, his nine-issue follow-up to his "Archangel turns story evil" arc, The Dark Angel Saga. And who are the central antagonists here? A new Brotherhood of Evil Mutants and Omega Red's bootleg, Frankenstein cousins. With Magneto currently on chummy terms with the X-Men, The Brotherhood of Evil Mutants brand has lost its luster. Hell, Toad is the janitor at Wolverine's newly formed Jean Grey School for Higher Learning in Wolverine and the X-Men. There have been scattered attempts to reform the band throughout X-history, but no one's been able to bottle that requisite nefariousness. Remender hopes to rectify this situation with Final Execution come spring. Some we have seen in X-Force before. The others are all bigs. And it's natural bigs! It's not just like, "This guy's pretty cool! Let's put him in!" [...] We spend a lot of time discussing "Why is this character is on the team?" and "What does that character bring to the team?" It's a lot of X-villains you've seen cooled off for a long time and a lot of re-imagined X-villains. We won't find out who's leading the Brotherhood for a while, but it will be a real shock. It's going to add an entire new level to this story. I don't think The Brotherhood's ever been this, "Whoa! You can't fight that." Their powers are uniquely suited to X-Force [...] Omega Red was created as a weapon, and the Omega Clan is sort of the same. They each have individual powers that are similar to the original Omega Red, and they're all individually built from his leftovers. I don't want to give away what their brains are thinking, but it will be a fun reveal. 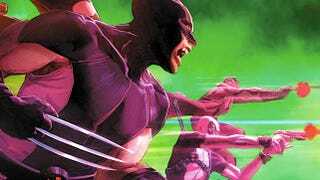 We see what their crazy powers are at the end of Uncanny X-Force #25. The Omega Clan will run afoul of X-Force when the team encounters White Skies, a buy-an-assassin shopping center hidden as a cloud floating above the Earth. "Any place that manufactures humans into weapons is going to piss off a couple members of X-Force. I always want a personal reason for why these characters take on these missions," noted Remender. Indeed, here's hoping complete carnage will be sold wholesale when Final Execution begins in Uncanny X-Force #25 this May. Top art of Uncanny X-Force #25 by Jerome Opeña. Death of Omega Red artwork from 2006's Wolverine: Origins #39 by Scot Eaton.